You are at:Home»What Is a Wallet? Lesson 8 – What Is A Wallet? In the world of cryptocurrency, you will hear the expression, wallet. What is a wallet? Simply put, a wallet is a mechanism or device that holds and secures your digital currency. Each wallet you own comes with a unique set of keys. Each wallet has a key to send (transmit) currency and a key to receive currency from others. The send (transmit) key is the most important key and the one you want to safeguard. Why? Because anyone who has your send key can use it to send themselves your money. A key is a unique string of code that secures your wallet. If you lose your keys, you lose access to your wallet. Thus, losing your cryptocurrency in them. Each cryptocurrency has its own wallet. If there are 1277 cryptocurrencies, then there are 1277 individual wallets and associated keys. Your Bitcoin wallet has its own unique key. Your Ethereum wallet (another cryptocurrency) has its own unique key. Your Litecoin wallet has its own unique key. I think you get the idea. The QR Code (Quick Response Code), is a two-dimensional barcode that is readable by smartphones that have the Google Authenticator app installed on them. The QR code in the example above has the key encoded in it. It is much easier to scan a key than it is to type in each character. 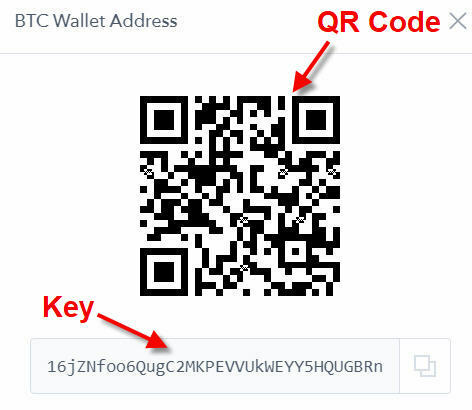 You will become accustomed to “copying and pasting” your wallet keys when you send and receive cryptocurrency and you will become accustomed to scanning your wallet transmit QR code for safe-keeping. Your Smartphone is the most valuable and secure device you own and the best place to run a wallet. There are different types of wallets, but they all do the same thing. There are online wallets. These are websites that provide you with free wallets. Many of these websites allow you to secure your wallets (lock or zip them up) so that no one but you can deposit or withdraw from them. In this course, the most reputable online wallet is Coinbase. I personally use and trust Coinbase. (The next lesson will be a discussion on setting up your Coinbase wallet. Setting up a wallet is free). There are “Desktop” wallets. These are wallets that run on your computer. Usually, certain Altcoin creators will provide this type of wallet for their Altcoin. The problem with this is that you will have a desktop wallet for each Altcoin you purchase! So most desktop wallets are not practical in my opinion. 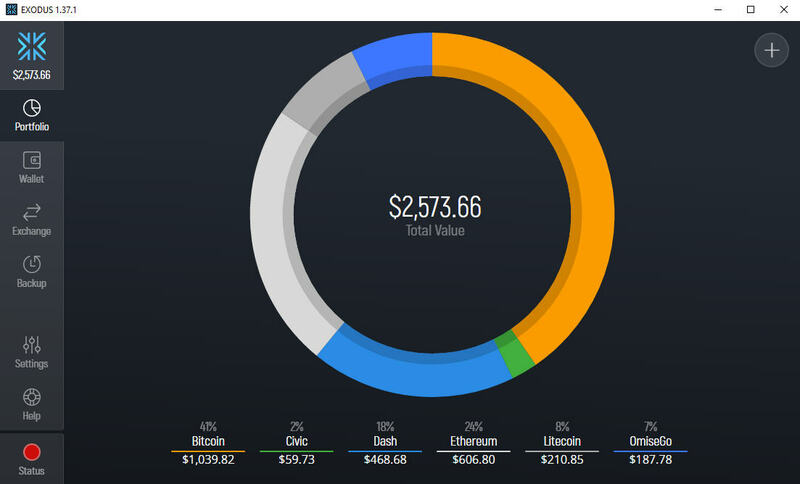 There is a desktop wallet called Exodus that allows you to hold your Bitcoins plus several of the other popular Altcoins. Below is an example of a Desktop wallet called Exodus. It is free to install and use. I personally use to store my Bitcoin and other Altcoin investments. Unfortunately, most desktop wallets run on the Windows Operating system and Windows is not very secure. All a hack would have to do is insert a virus into your computer and record your keystroke and gain access to your wallet password and then keys. There are Smartphone Wallets. Since your Smartphone is the most secure asset you own, it is a very good choice to run your wallet. The apps are free and easy to use. I recommend one of the following apps for your Smartphone. As you begin to amass more cryptocurrency, I recommend using a Smartphone wallet. I will dedicate a lesson to setting up and using one. There are Hardware Wallets. These wallets resemble a USB stick. They are encrypted and very difficult to hack into. They allow you to store your cryptocurrency holdings in an “offline” method. Online and Desktop wallets are connected to and reliant upon the Internet to work and automatically update your earnings for you. This is not a problem as long as you secure these wallets. I will show you how in a future lesson. Hardware wallets are only connected to the Internet when you need to make a cryptocurrency transaction and disconnected when you are finished. Those who use Hardware wallets are persons who hold significant amounts of digital currency and want the highest possible security for them. The downside to using hardware wallets is if you lose the device. It is like losing a wallet or a purse full of money. At present, I do not use a hardware wallet but will once my earnings reach a significant amount worth securing at the highest possible level. When I decide to invest in a Hardware Wallet it will be either a Ledger (Ledgerwallet.com) or a Trezor (https://shop.trezor.io/). (Never buy a Hardware wallet on Amazon.com or another online vendor. ALWAYS buy directly from the manufacturer). I find a Coinbase (online wallet) and Exodus (Desktop wallet) to work just fine and together they fulfill all of my digital currency storage needs while at the same time provide me with a level of confidence that my holdings are safe and secure. It should be noted that online and desktop wallets automatically adjusts the values of the coins within your wallet based on the movement of the cryptocurrency marketplace for that day. This is a great feature. AVG Free (antivirus application). Download and install. Update the definitions every other day and scan your computer at least once per week. SuperAntiSpyware FREE Edition (spyware and malware detection, scanner, and remover). Update the definitions every other day and scan your computer at least once per week. CCleaner (junk file remover). Scan your computer every day, if used. Removes all junk and Internet files from web browsers (cookies). Actually speeds up your computer.